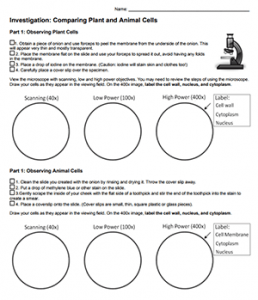 This simple investigation asks students to view cells under the microscope and compare differences between plant and animal cells. Students are instructed in the procedure for removing the epithelial cells of an onion and staining with iodine. These cells are fairly easy to see and most beginning students will have no trouble locating the cells and identifying the cell walls and nuclei. They should observe that the cells are stacked like boxes, exactly how Robert Hooke described the cells he first saw. Many students will ask why the cells aren’t green. Onions are roots, they do not photosynthesize, so you cannot see chloroplasts in them. I have another activity that focuses on plant cells only and asks students to compare onion cells to elodea cells. Unfortunately, it has become more difficult to obtain elodea and impossible in states where it has been labeled invasive. The second task requires students to obtain cells from their cheek and stain them with methylene blue. Cheek cells are much more difficult to find and identify, as they are much smaller and more spread out than the onion cells. Some states and districts do not allow samples to be taken from students. If this is the case, you can provide preserved slides for students to view instead of their own cheek cells. I also recommend you create a few onion slides of your own for students who struggle with the preparation. If you have a big class, you may not notice right away that a student has a huge chunk of onion on their slide instead of the thin membrane. (Yes, this has happened to me!) The time required varies widely depending on how well students can use the microscope, I usually place other slides for students to view so that those who finish early have other things to look at. I have a few on quizlet: https://quizlet.com/_j7uw3 My user name is muskopf1, lots of quizzes on cells and other topics.